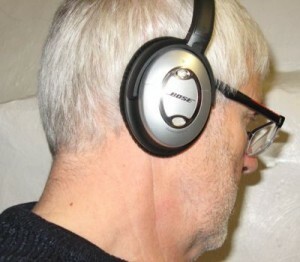 Listening to music on the go has reached new heights with the release of the latest QC20i noise cancelling headphones from Bose shown on the left. For guys who wear glasses to watch the in-flight movie the cans push onto the side arms. Not so with the new QC201. The original Quiet Comfort 15 system had a couple of disadvantages. There is a need to remove them to hear anyone want to speak to you; like “Would you like a drink from the trolley sir.” Secondly, they can weight a bit heavy after a couple of hours, if you wear glasses they squeeze the side arms into your head and lastly if you get a touch of the nods and the earphone touches the headrest the noise of the aircraft is then transmitted through the earphone. The startled produced look can be upsetting to fellow travelers. The size of the travel pouch require degree of forethought to extract them from the carry on baggage before sitting down, especially of you are marooned in the window or mid aisle seat. 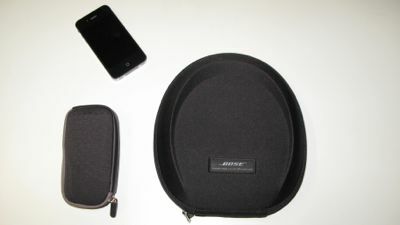 New QC20i pouch shown on the left, Quiet Comfort 15 travel pouch shown on the right. iPhone shown in top for size comparison. Imagine the delight of trying the new QC20i noise cancelling headphones from Bose. 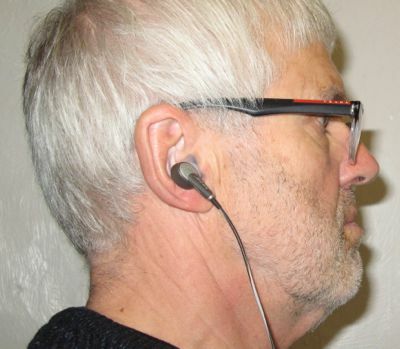 These compact, lightweight headphones fit into the ear. Impossible to consider the performance could be equal to the larger over ear headphones. But this is exactly the result and the storage package is about the size of the pouch for your iPhone. The lightweight format makes them far more comfortable and crucially they come with a switch whereby you can cancel the noise deadening facility. You don’t have to take them out of your ear or dangle one earpiece whilst the drink order is being placed! Slipping them into your pocket makes them infinitely more portable and with the easing of the restrictions in the use of electronic equipment in the aircraft cabin during landing and take-off the use is greatly extended. The rechargeable battery is claimed to last 10 hours so t should see you through most long haul flights. If like me you fly to Australia you may run out range but the body needs some sleep? Just remember to switch the headphones off, although then you then loose that beautifully quiet environment.